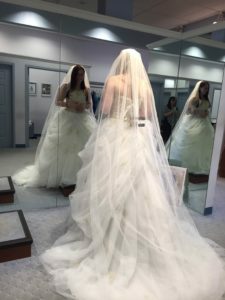 It’s been a bit since I wrote about wedding planning with CRPS. But let me tell you, a lot has been going on behind the scenes. You think that starting to plan almost two years in advance would be enough, but obstacles do come up. If you want to read about the proposal, click here. If you want to read about how I picked my venue, click here. 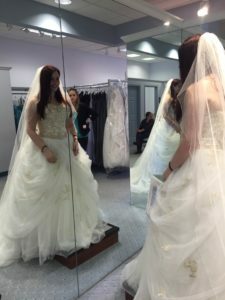 Before we delve into wedding dress shopping, I wanted to say something. Just because you have CRPS or your significant other has CRPS doesn’t mean you can’t get married and live out your fairy tale. CRPS is a challenge, I would never deny that. I believe the “in sickness and in health” portion of standard vows applies greatly here. You are lovable. You are capable of loving. You need to do what is best for you. Don’t push people away because you have CRPS. While you may think it could be easier or will cause the other person less pain, that isn’t necessarily true. True love knows no boundaries. So many of you have sent me beautiful emails about wanting to have a wedding, but not thinking it was possible until now. It is possible! If you or your partner are hesitant, make sure you have an open and honest discussion. Although my wedding isn’t until next year, I wanted to get a head start on everything. Between planning the wedding and planning events for RSDSA, I have to make sure I stick to a timeline so I don’t get overwhelmed as the wedding gets closer. Who wants to have a CRPS flare for their wedding? Not me! I made a dress appointment early. I have been studying wedding dresses since high school. Yes, studying! I was in a fashion marketing class that I had to create a magazine for. Mine happened to be on wedding fashion. I also watch Say Yes to the Dress, I Found the Gown, and other wedding shows on a regular basis. I was completely prepared going into this appointment. So, how did I prep for this appointment? I utilized my personal Pinterest to look at styles of dresses I liked. I had a couple of my bridesmaids and my mom add to this board since I wanted options (although, we ended up pinning the same dresses). Since I was going to a specific store, I also found dresses I liked from that store and took down their numbers so they could pull the dresses easier. I made a list of things I wanted my dress to have as well as a list of things that would make or break the sale. One of the key elements was that the dress did not irritate my skin because of the fabric. I do have extremely sensitive skin because of CRPS, so I didn’t want to be instantly uncomfortable. If I was instantly uncomfortable, imagine how I’d be by the end of the wedding day! I wanted a glamorous dress that wasn’t too heavy. The very last thing I would need is to be weighed down by my dress. That could have led to several different things: limb irritation, overheating, exhaustion, and even being too weighed down to walk. It sounds like a lot, but it actually did not limit my selection too much. The consultant I had was actually the store’s manager, which worked in my favor. I warned her that I am sensitive to touch because of the CRPS, so when she helped me into dresses I needed her to be extremely careful. She found ways to help me get into dresses with the least amount of irritation possible. (Yes, I make everything a CRPS awareness opportunity). I told her the style I wanted, but that I was open to anything. She let me try on the specific dress that I went in for and then used that as the base. I started with a larger than life, excessive ball gown (as seen in the images above and below). We thought it was pretty and that it would be THE dress, but we were quite wrong. Looking back at the pictures that my mother and bridesmaids took, I’m glad I didn’t end up with that dress! I tried on about twelve dresses. The dress I ended up with was nothing I expected. (I can’t give away too many details here just in case the fiancé gets nosey). The dress passed all of my tests. I wasted time prior to taking it off to make sure the fabric was not irritating and to make sure it wasn’t too heavy. I half-danced in it to make sure I could move. I used my cane to make sure it wouldn’t get in the way while I walked. I walked back and forth the length of the store to see if I had any issues in it while I walked down a narrow aisle with gown and cane surrounding me. No issues. It is the perfect dress. My mom and my two best friends all instantly got on their feet as soon as I came out of the room with that dress on. It was much more elegant than a few of the princess-like dresses I had tried on. They all examined it very closely. Then it happened- everyone cried. Now, I must admit I was shocked to see this, because my two friends hate to cry (my mom and I are the same person, so I was just waiting for her to cry). So, I bought the dress… and the headpieces. I almost show my fiancé my dress about once a day and then remember he’s not allowed to see it. I had to delete it off of my phone because I was so tempted. Only 13 months until he can see it (and until I can share it with all of you). Establish a price point right away. So many of us are on a tight budget because of CRPS. Make sure you make this budget clear to your consultant (and to yourself). Call the bridal shop ahead of time to make an appointment. You may want to prepare them ahead of time by telling them if you are mobility impaired and/or sensitive to touch. You will want to remind them again when you get to the appointment. Find a style of dress that you like and bring pictures! You need a starting point. Look at the fabrics of the dresses you like online. Are they materials that would irritate your skin? You may want to bring your own slip or call the shop ahead of time to see what they can do. Test the dress out. Don’t be afraid to try to wear it around the shop or move around the best you can in it. If you use a mobility device, make sure that the dress can be altered to accommodate it. Don’t forget that alterations and accessories are not included in your dress price. Factor that in as well. Have a question about weddings and CRPS? Want me to discuss a certain element I haven’t covered yet? Send me an email at SBarrett@rsds.org!